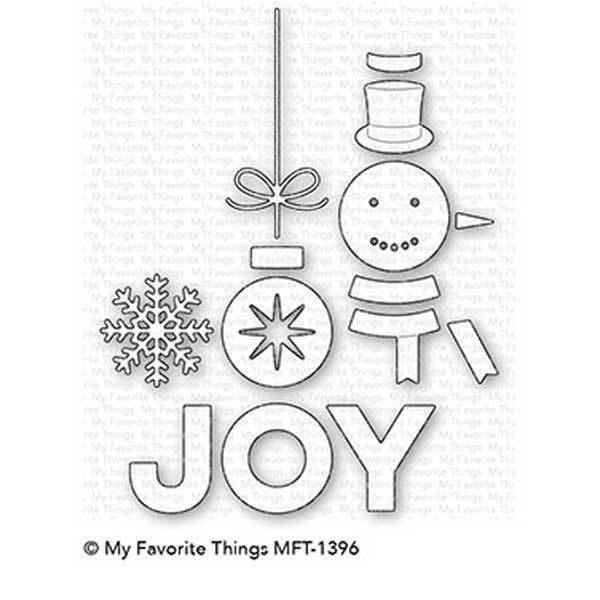 Filled with Joy die set by My Favorite Things. You are going to be amazed by all the mix-and-match opportunities the Filled with Joy Die-namics provides — we’ll start with the big and bold sentiment. 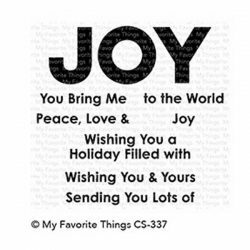 JOY represents the epitome of holiday feelings for many of us and making it the focal point of your Christmas cards is always a good choice. If you want to kick things up a notch though, we’ve got you covered…we’ve provided three alternate options for the “O” in the sentiment. Use the included snowflake, star-emblazoned ornament, or snowman — all sized to match the word — to add some extra personality to your greeting. 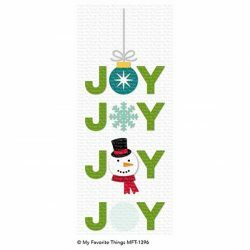 Both the ornament and snowman feature multi-piece designs to create dimension while allowing you to customize with contrasting color and texture. Of course, you can create separate card elements with the pieces as well. The sky is truly the limit with this one! Alternatively, trim one of the Circle Trio Shaker Pouches to size and pop it in place to add a festive shaker element to your cards. Are the wheels spinning yet? Complete your card with one of the lead-in or follow-up phrases packed into the Filled with Joy stamp set, sold separately.